So easy to install and uninstall. Baby is very cozy and I love the reclining feature on this car seat. So far it hasnâ€™t made her incredibly sweaty and hot and the color is just so cute. Overall very happy with my purchase and Albeebaby is my absolute favorite go-to for baby gear! Pros-cozy -easy to install/uninstall -multiple recline feature -nicely padded straps -doesn?t get horribly hot -nice sleek but cute look -baby and toddler approved! Cons-cup holder is a little flimsy but personally don?t find it to be that big of a deal. This car seat is very comfortable for the child. Super squishy material, crotch buckle pad is awesome. Has a little tab that prevents it from sliding up around buckle which I love! I like the design. Supercinch latch easy to use, like the storage compartments for it. I use it with the seat belt as my child is over the weight limit for LATCH. If I buy another I would definitely pay extra for the ZIP model for ease of belt installation and cleanup. Great seat at a great price! We already had one of these we'd purchased for my wife's vehicle from Albee Baby. Very happy with it. The belts adjust without disassembly, which is a major plus. Our daughter loves it, too. Great product. Purchased for our 2.5 year old who is still rear facing. The passing in the seat is great she doesnâ€™t complain about being uncomfortable. Installation with the latch system was so easy. Havenâ€™t tried a seatbelt install but seems just as easy with the belt lock offs. The headrest is easy to adjust for height. Tightening the harness straps is also very easy. I love that I can keep her rear facing until 49inches in this seat. As with most Chicco products, the quality is there. This is the third Chicco we've bought and I would recommend them to anyone. This is the one that does not have the zip off cover but this seat is only used about once a week for our granddaughter. If it was a daily use, I would have bought the removable cover. It's easy to instal but is quite heavy so not a good seat if you want to remove it out of the car frequently. We have the infant to 30 pound model also but she's too tall for it now. Excellent product overall. ConsBecause it's so well constructed, it's heavy. Best UsesUse stationary. Not great if you need to transfer frequently because of it's weight. We have used chicco for all 5 of our babies and are never disappointed. I don't have to worry about proper installation because the system is so easy, it's a proper, tight install every time. I ordered this car seat for my son thinking this was an orange color when in fact its definitely more like a pink. I wasnt going to pay to ship it back and wait for a different car seat so I just called Chicco and ordered a different seat cover. Maybe we will have a little girl in a year or two so we can use this seat cover. I would definitely buy another Chicco car seat! I loved my sons Chicco keyfit30 he had as a baby. This seat is easy to install just like his infant car seat was! ConsLooks more like an orange online but in person itâ€™s a pinkish color definitely wouldnâ€™t recommend for a boy..
ProsSeems to be very safe. ConsGets really hot. There's also way too much padding with it. This has many pros: Seat is deep (looks very safe when my little is sitting), able to adjust recline easy (when little fall asleep, this is great). pretty color (I like pink). I am satisfied with this product ! This is the second Chicco Nextfit we buy and our son loves both. It looks well-built (we still checked safety ratings) and the installation is (mostly) a breeze. It is hard to tell until you see it, but it's more like a protective cocoon than a seat and puts my mind a little more at ease (and puts my son to sleep in under 10 minutes). I have had this car seat for my four year old for about two weeks. I was impressed at the quality as soon as I took it out of the box. That being said, it is bulky and heavy and would not be ideal for someone looking to use this one seat in multiply cars. It is however, easy to remove and secure using the latch system. Despite the price, this car seat can be used for many years. It is versatile, giving you the option of both rear and forward facing positions. Moving the latch belts from rear facing to forward facing is made extremely easy! It is a seat that will grow with your child. Overall, I am very happy with this seat. Last month on a 3 hour car ride my two year old (who just turned 3 last week) figured out how to unbuckle his top buckle on his car seat. I IMMEDIATLY felt unsafe driving and wanted to purchase a new car seat. After many sleepless nights wondering how I was going to prevent this from happening a friend recommended the NextFit iX. I was so happy and couldn't wait to try this newly designed car seat out. Love the color and the material. I feel very safe now driving around because my 3 year old stays safely buckled throughout every car ride. I would recommend this seat to anyone who needs piece of mind that their child is safe and all buckles remain secure during each and every car ride. Great new convertible seat! We have four grandsons 6 and under... My daughter has an evenflo, diono and britax. We were always switching seats between cars and they were all a pain. This was by far the easiest to install, has new adjusters with loops to tighten the seat once you've tethered it to your seat. After years of jumping or pulling or things to tighten my grandkids seats in, this was great. It is comfy, great padding and was even designed with a little nook in the back for the car seat handbook. There are pictures and great descriptions. It is our favorite and grandparents approved! 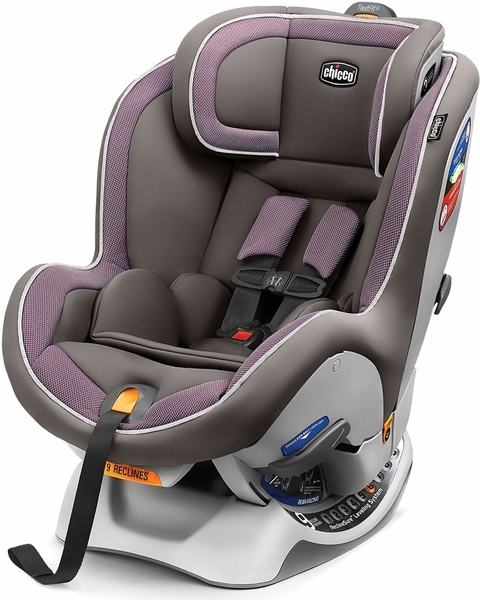 The Chicco NextFit iX Convertible car seat is certainly worth every penny of the price. Where do I even begin? The look is modern with a durable yet comfortable cover which our granddaughter loves. 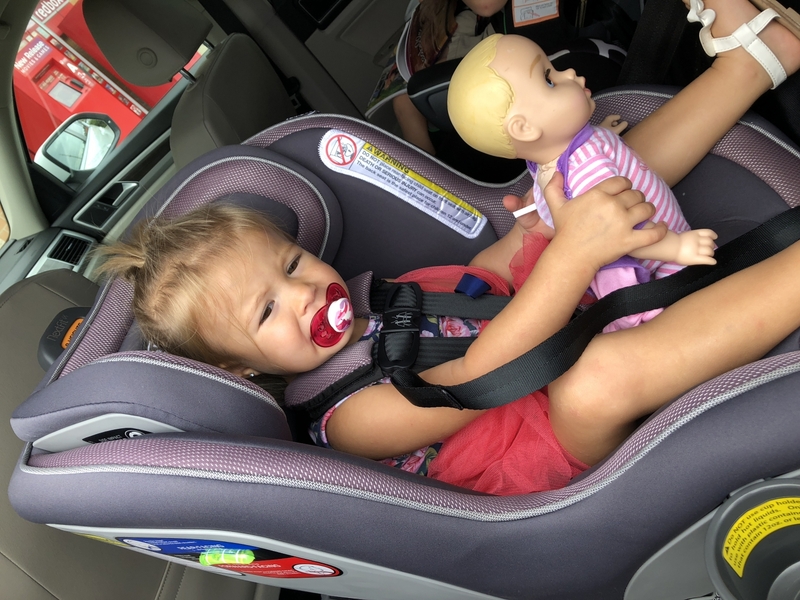 The harness straps are easy to tighten/loosen and allow me to have no worries about her not feeling secure in the seat (the headrest is soft and well-padded as well). The cover is easy to zip off, which makes cleaning it a simple process. We love the recline functionality of the seat as it's so easy to adjust to make sure it is positioned in a level state. It's easy to install and when the seatbelts are pulled tight, there is no sliding back and forth of the seat itself, which makes me know she's safe in there. This is a VERY well-made product and I have no complaints about it at all. I highly recommend it to others. Withing a few days of receiving this car seat, my son had a major blowout. To spare too many details, let's just say we were in love with the zip feature and the ability to just throw the liner in the wash! The eucalyptus color is even better in person, too! Love everything about this car seat! Dual RideRightï¿½ bubble level-indicators verify seat angle in both rear-facing and forward-facing modes. SuperCinchï¿½ LATCH tightener with force-multiplying technology helps achieve a tight and secure fit. LockSureï¿½ belt-tightening system helps achieve a secure installation with vehicle seat belt. The NextFitï¿½ iX features a nine-position ReclineSureï¿½ leveling system and two RideRightï¿½ bubble level-indicators to help achieve and verify proper angle in the vehicle seat. With more recline options than any other convertible, ReclineSureï¿½ is designed to accommodate a wider range of vehicles in both rear-facing and forward-facing modes. For installation with LATCH, premium connectors and a SuperCinchï¿½ force-multiplying tightener help achieve a secure fit with a fraction of the effort. For installation with the vehicle seatbelt, newly redesigned lock-offs with LockSureï¿½ technology make it easy to position, tighten and lock the belt into place. NextFitï¿½ iX is built to grow from newborn through preschool with easy-to-use adjustability to accommodate every stage, including smooth one-hand headrest adjustment with nine positions. As the headrest is raised, the harness shoulder strap position auto-adjusts in height and width to accommodate growing children without re-threading. The 5-point harness also features a one-pull, force-multiplying tightener and removable, machine-washable shoulder pads. For easier in/out, NextFitï¿½ iX is also equipped with a padded ComfortFlexï¿½ harness management system that holds both sides of the waist belt out of the way until the child is ready to be buckled. An integrated slide path makes it easy to re-position the LATCH strap when itï¿½s time to switch from rear-facing to forward-facing. Premium fabrics offer a chic, luxurious aesthetic to complement automotive interiors Padded ComfortFlexï¿½ harness management keeps both sides of waist belt out of the way for easy in/out!